Helayne Cohen has worked in clay ever since she took a pottery class at Syracuse University as part of her BFA in ceramics. She moved to the Vineyard in 1987 with her husband, Frank Folts, and started working at Chilmark Pottery. Soon she built a studio in her basement and then moved her workspace into a small free-standing studio beside her house. Her work has been a quiet and steady presence on the Vineyard for over three decades now. Her work is beautiful, with function and clarity of form taking precedence. “I make pottery for daily life,” she says. She’s inspired by the colors of the Vineyard, especially the greens and blues of the ocean. Beading barrettes allows her to explore endless combinations of colors. She’s been making them since 1988, when she was inspired by the beadwork she saw at Grateful Dead shows. Her latest barrettes are made-to-order for weddings, made with glass seed beads, freshwater pearls and Austrian crystals woven onto French findings. A new collaboration between Birdsong Ceramics and Stefanie Wolf Designs combines the mediums of beadwork and ceramics. 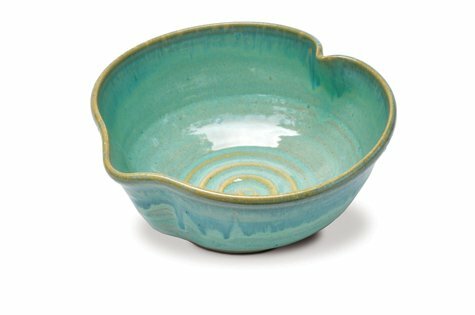 The Island Keepsake bowls are especially designed to hold jewelry. Helayne melts Stefanie’s glass beads onto her Island embossed bowls “to create unique splashes of sea inspired color. Helayne uses embossing in many of her pieces, making stamps out of hand-carved clay then pressing them into cups, bowls, and more as the wet clay firms up but while it’s still pliable.The timing of each step in the process is essential. The Island Keepsake bowls are available at Stefanie Wolf Designs, both online and in Edgartown. Her beaded barrettes are available at Sioux Eagle Designs in Vineyard Haven, as they have been for thirty years. Helayne will be selling her pottery and beadwork at the Oak Bluffs Arts District Stroll on the first Saturday of each month through September. For special orders or to arrange a studio visit, call or text 774-310-0925. You can also contact her through her Facebook page, type: Birdsong Ceramics.